The MAN van outfitting solutions designed by StoreVan make it possible to create actual, professional mobile workshops on-board vehicles, quickly and at low cost. 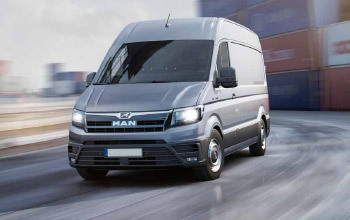 Whoever buys a MAN van chooses the industry-specific expertise of a manufacturer that has been producing industrial vehicles for years: safety and functionality for reliable work partners. StoreVan designs and manufactures equipment for MAN vehicles with tailor-made marine wood flooring, polypropylene panelling for side walls and modular shelving that can be integrated with a wide range of products that add potential to each work van, such as work benches with vices, loading ramps, storage racks, ladder racks and much more. MAN outfitting created by StoreVan will not only optimise interior space, protecting the cargo area, but will also offer outstanding safety, in the form of flooring with TUV friction certificate, anchor points and airline guides for perfect load fixing. Whoever chooses a MAN van aims for nothing less than perfection: impeccable interior finish, safety as a top priority, endless modular shelving solutions and modules that can be integrated for top class performance. Thanks to the expertise, skills and professionalism of the StoreVan work team, each outfitting project is designed specifically for one vehicle, offering customised solutions for different application sectors. With StoreVan’s shelves for vans, specially designed for MAN models, optimising spaces and arranging goods will no longer be an issue: thanks to dividers, partitions, fully extensible drawers, compartments with doors, small part case shelves and trays, and much more, everything will be in its place. MAN van outfitting will make your work smoother and your life easier!